Update, 05/09/09: Thanks to Chaya who left a comment seeking a gluten-free version, I have scoured the internet and come up with some likely substitutes. If you do try the gluten-free version, give me a shout and let me know how it goes ok? Thanks. 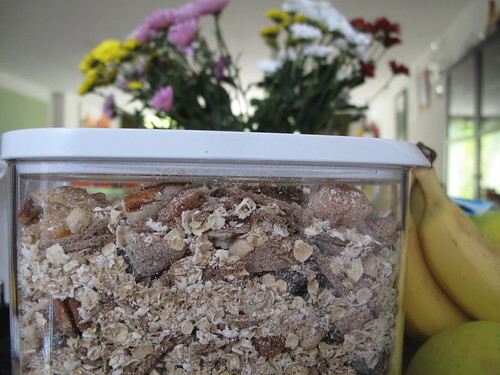 If you are a muesli fan, then you’re in business. This how-to teaches you to make your own. 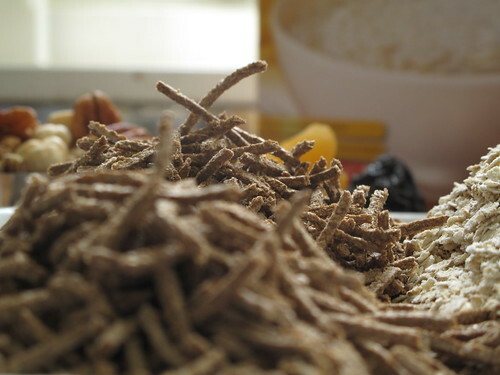 Not only is it cheaper, but it is healthier – no added sugars or salts and now you can have more pecans than raisins or more oats than bran if you want. It is all yours to make perfect. 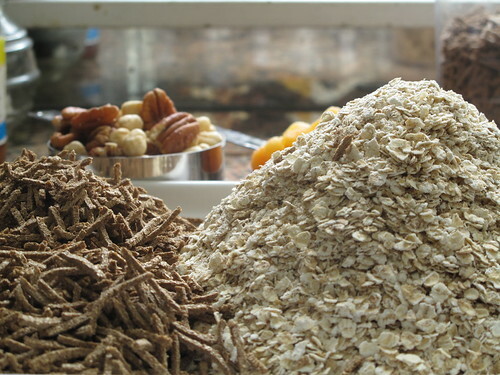 Imagine all the goodness, all that fibre and the heart-friendly benefits of oats . 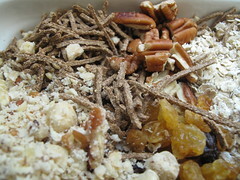 And some dried fruit and raw nuts. Optional: To make it extra special, you can add 1/2 a teaspoon of cinnamon or vanilla powder, some flaked/dessicated coconut, chocolate chips….. the list is endless. I usually scale this recipe up so I make a lot and then I have enough to last a while. 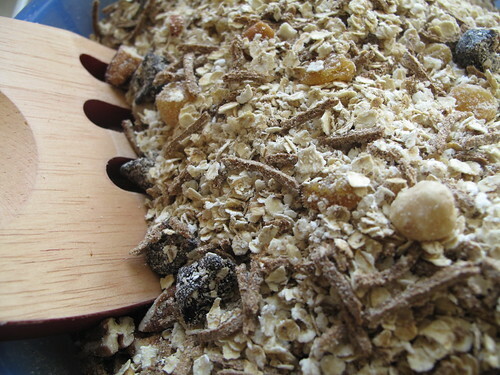 All you have to do is measure out the oats and bran into a large bowl. 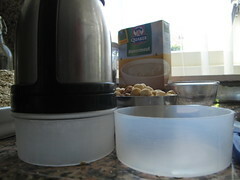 Then chop the nuts if need be – I use my super-duper onion chopper! 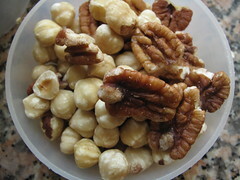 You can use any combination of nuts, my favourites are hazelnuts for its somewhat chocolatey taste and pecans for its amazing nutiness and soft crunch. 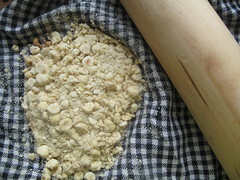 Sometime, I use whole almonds and sometimes I go for flaked. 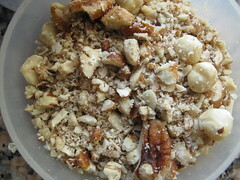 I’ve also put in some Macadamias and Walnuts in the past. 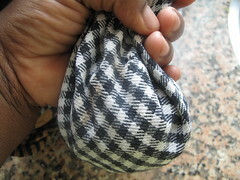 If you don’t have an onion chopper, you can still crush the nuts by putting them in the centre of a clean kitchen towel. 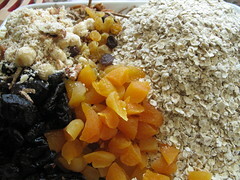 Hold the ends up together so thenuts are gathered in the middle and then lay that on a flat, sturdy worktop. 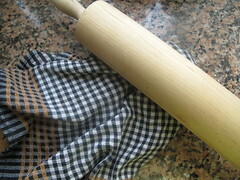 With a rolling pin, hit the nuts in the kitchen towel till they are crushed. 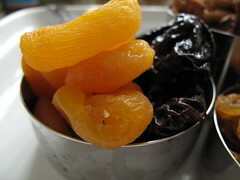 Then with kitchen scissors, I cut up into small pieces the Apricots, Prunes and whatever large dried fruit I’m using. 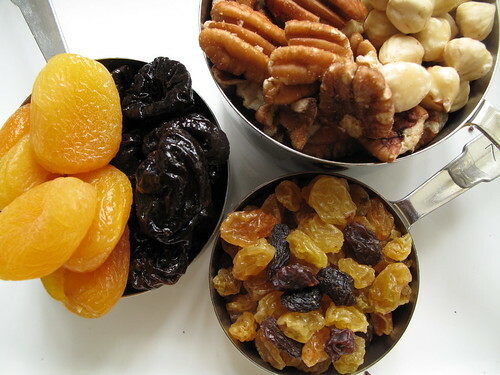 Dried Apples and Pears are nice, as well as some tropical dried fruit like Pineapples, Mangoes and Papaya – though I’ve found some varieties incredibly sweet! All that remains is to give a good mixing and when it’s all come together, carefully put into an air-tight container and store well, and if you’re hot on vanilla, stick a pod in…. 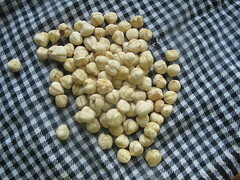 you could even rub some vanilla seeds in as well . Perfect for Swiss Bircher any morning of the week, sprinkled over yoghurt for a snack, tossed into some Muesli muffins and…. I could go on and on but get off the computer, go try it and tell me what you think. Did you enjoy this? See other how-tos!